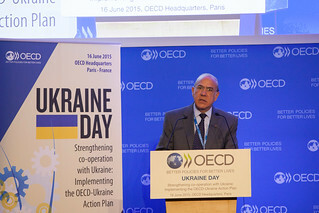 It is an honour to welcome so many high-level delegations to the OECD “Ukraine Day”. Your presence is a clear signal of your commitment to deepen the collaboration between Ukraine and the OECD and give life to our recently signed OECD Action Plan for Ukraine. The goal of this meeting is to deepen our exchanges on the needed reforms in Ukraine and ensure the effectiveness of the Action Plan. Today, we want to hear from all of you in order to build synergies and bridges in the various areas of our support to the Ukrainian Government. Despite major efforts by the Government to stabilise the economy, Ukraine faces a deepening recession, largely due to the disruptions caused by the military conflict in the east. Real GDP shrank by 6.8% in 2014, and is expected to further decline by 7.5% in 2015. Inflationary pressures are high: the year-on-year inflation rate climbed to 45.8% in March. The ratio of public and guaranteed debt to GDP rose from 40.6% in 2013 to 70.6 % in 2014, and unemployment increased to 9.3% in 2014. The economy should gradually improve in 2016 but this will depend on the outcome of the military conflict and on the continuation of reforms by the Government. The Government has already taken many decisive steps to improve the economic situation in several areas, including through improved regulations, restructuring of state-owned enterprises, combating corruption, reforming the public service and modernising the financial system. It has also taken a number of measures to contain the budget deficit which decreased to 4.6% in 2014 compared to 4.8% in 2013 despite the fall in output. Recently the pace of reforms has accelerated. In April, the Ukrainian Parliament adopted a law on investors’ protection. In early June, it approved a resolution to endorse the Reform Legislation Support Plan of Ukraine which includes 182 new laws and more than 300 changes to various regulatory documents, covering issues such as constitutional reform and rule of law, regional policy, decentralisation, national security and defence, environmental policy, international liabilities and economic reform. Ukraine’s structural reform efforts should be commended and further encouraged to help put the economy on the path of sustainable and inclusive economic growth. The country has a number of strategic assets such as high literacy rates, an important industrial legacy, the potential to become an energy hub and a large agriculture landmass. By continuing to increase competition, developing the financial sector, strengthening the conditions for foreign direct investment, improving energy efficiency and further fighting corruption, the Government will help Ukraine fulfil its potential. And the OECD is standing by Ukraine along this road. The OECD has worked with Ukraine since its independence, and our collaboration has gradually intensified and deepened. In October last year, the OECD and the Government of Ukraine signed a Memorandum of Understanding to strengthen cooperation, and on 22 April 2015 we signed a joint Action Plan based on Ukraine’s reform priorities around three priority areas: i) anti-corruption, ii) governance and rule of law, and iii) investment and business climate. Our discussions today are structured along these pillars. Some of the activities included in the Action Plan are already underway, such as OECD support on the establishment of a National Anti-Corruption Bureau, an e-procurement system, and civil service reform, a second OECD Investment Policy Review, capacity building on fighting tax crime, an OECD Review of Integrity in Public Education as well as related work on education policy reform. These activities are being carried out thanks to the financial support of some of our Member countries (Estonia, Poland, Sweden and the United States), countries in process of accession to the OECD (Lithuania and Latvia), as well as the Open Society Institute and the European Union. Let me also stress the commitment by Ukraine to move closer to OECD standards and practices. During his visit to the OECD on 22 April, the Ukrainian President Mr Poroshenko acknowledged the importance the OECD could have in taking to Ukraine the “best global standards for improving policies and people’s lives”. The Ukraine Prime Minister also visited the OECD on May 13 to discuss the implementation of the Action Plan. The presence here today of a high-level delegation from Ukraine shows one more time the importance given to the implementation of the Action Plan by the Government of Ukraine. I would like to reiterate our confidence in the ability of Ukraine to reform and stress once again the relevance of more in-depth exchanges with OECD countries and partner economies. The OECD has a long experience in supporting countries in Central and Eastern Europe in their political transformation and their effective transition towards a market economy. Today, some of these countries are successful democracies, prosperous market economies, and OECD Members. We will use all our accumulated knowledge to assist Ukraine at this important moment of its history. We very much look forward to working with all of you to contribute to strengthening Ukrainian institutions and accompany Ukraine in its reform process. Thank you very much and let me now give the floor to the Minister of Economic Development and Trade of Ukraine, Mr. Aivaras Abromavičius.